In this section, we will walk through configuring an IKFast plugin for MoveIt! MoveIt! IKFast is a tool that generates a IKFast kinematics plugin for MoveIt using OpenRAVE generated cpp files. This tutorial will step you through setting up your robot to utilize the power of IKFast. MoveIt! IKFast is tested on ROS Melodic with Catkin using OpenRAVE 0.8 with a 6DOF and 7DOF robot arm manipulator. While it works in theory, currently the IKFast plugin generator tool does not work with >7 degree of freedom arms. If you haven’t already done so, make sure you’ve completed the steps in Getting Started. Installing OpenRAVE on Ubuntu 16.04 is tricky. Here are 2 blog posts that give slightly different recipes for installing OpenRAVE. Install the MoveIt! IKFast package either from debs or from source. Working commit numbers 5cfc7444... confirmed for Ubuntu 14.04 and 9c79ea26... confirmed for Ubuntu 16.04, according to Stéphane Caron. Please report your results with this on this GitHub repository. First you will need robot description file that is in Collada or OpenRAVE robot format. If your robot is not in this format we recommend you create a ROS URDF file. cp "$MYROBOT_NAME".dae "$MYROBOT_NAME".backup.dae  # create a backup of your full precision dae. rosrun moveit_kinematics round_collada_numbers.py "$MYROBOT_NAME".dae "$MYROBOT_NAME".dae "$IKFAST_PRECISION"
From experience we recommend 5 decimal places, but if the OpenRAVE IKFast generator takes to long to find a solution, lowering the number of decimal places should help. This is useful if you have a 7-dof arm and you need to fill in a –freeindex parameter, discussed later. You should see your robot. Once you have a numerically rounded Collada file its time to generate the C++ .h header file that contains the analytical IK solution for your robot. You need to choose which sort of IK you want. See this page for more info. The most common IK type is transform6d. 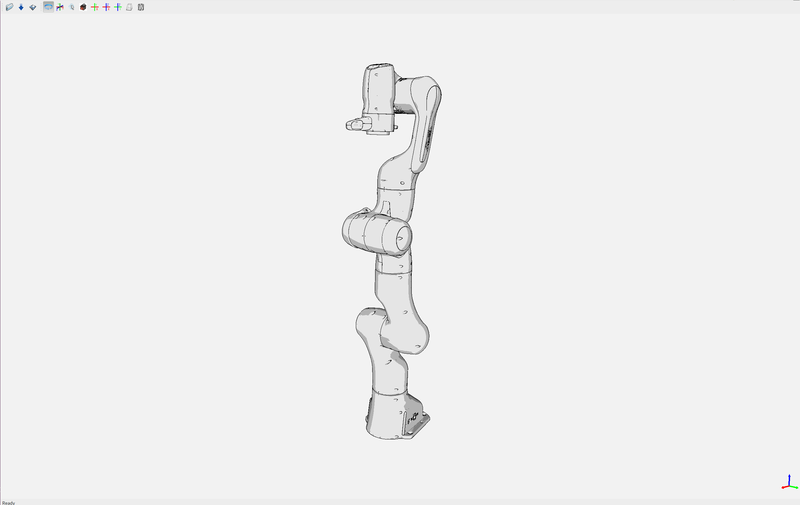 A typical 6-DOF manipulator should have 6 arm links + a dummy base_link as required by ROS specifications. If no extra links are present in the model, this gives: baselink=0 and eelink=6. Often, an additional tool_link will be provided to position the grasp/tool frame, giving eelink=7. The manipulator below also has another dummy mounting_link, giving baselink=1 and eelink=8. python `openrave-config --python-dir`/openravepy/_openravepy_/ikfast.py --robot="$MYROBOT_NAME".dae --iktype=transform6d --baselink="$BASE_LINK" --eelink="$EEF_LINK" --savefile="$IKFAST_OUTPUT_PATH"
python `openrave-config --python-dir`/openravepy/_openravepy_/ikfast.py --robot="$MYROBOT_NAME".dae --iktype=transform6d --baselink="$BASE_LINK" --eelink="$EEF_LINK" --freeindex="$FREE_INDEX" --savefile="$IKFAST_OUTPUT_PATH"
The speed and success of this process will depend on the complexity of your robot. A typical 6 DOF manipulator with 3 intersecting axis at the base or wrist will take only a few minutes to generate the IK. Known issue –freeindex argument is known to have a bug that it cannot handle tree index correctly. Say –baselink=2 –eelink=16 and links index from 3 to 9 is not related to current planning group chain. In that case –freeindex will expect index 2 as link 2, but index 3 as link 10 ... and index 9 as link 16. You should consult the OpenRAVE mailing list and ROS Answers for information about 5 and 7 DOF manipulators. rosrun moveit_kinematics create_ikfast_moveit_plugin.py "$MYROBOT_NAME" "$PLANNING_GROUP" "$MOVEIT_IK_PLUGIN_PKG" "$IKFAST_OUTPUT_PATH"
python /path/to/create_ikfast_moveit_plugin.py "$MYROBOT_NAME" "$PLANNING_GROUP" "$MOVEIT_IK_PLUGIN_PKG" "$IKFAST_OUTPUT_PATH"
Use the MoveIt RViz Motion Planning Plugin and use the interactive markers to see if correct IK Solutions are found. If any future changes occur with MoveIt! or IKFast, you might need to re-generate this plugin using our scripts. To allow you to easily do this, a bash script is automatically created in the root of your IKFast package, named update_ikfast_plugin.sh. This does the same thing you did manually earlier, but uses the IKFast solution header file that is copied into the ROS package.